They often fail to rattle and seldom strike; however if they do their venom is highly toxic. The Tiger rattlesnake is a medium sized (up to 35 inches long) blue-gray or orange-brown rattlesnake with a disproportionally small head. Dark and sometimes diffuse “tiger” bands cross the back. The tail is often brownish near the large rattle and usually lacks the color bands seen adjacent to the rattle on our other two Sabino Canyon Rattlesnakes. While this snake is active from spring through late fall, its peak of activity correlates with the summer monsoons. Though not rare, it is rarely seen, as it is primarily nocturnal. Mating occurs in April, with four to six, 9-inch-long young born late June through September. Tiger rattlesnakes eat small mammals and lizards; juveniles generally favor lizards more than do adults. Though these are small rattlesnakes, they have been known to eat fairly large prey, including kangaroo rats, packrats, and even spiny lizards. 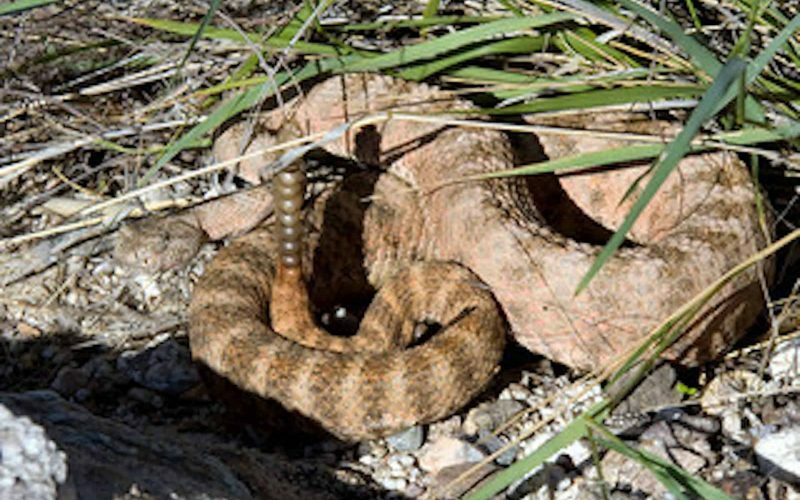 Usually not overly aggressive when encountered, Tiger Rattlesnakes often fail to rattle and seldom strike; however they will strike and their venom is highly toxic. Tiger Rattlesnakes are found in both Upper and Lower Sabino Canyon. This photograph was taken in August 2009 in lower Sabino.